Ernest et Célestine is a 2012 French-Belgian animated film directed by Stéphane Aubier, Vincent Patar and Benjamin Renner based on beautifully illustrated books by Gabrielle Vincent. The film was released in December 2012 in France and Belgium and won a Cesar (French Oscars) for best animated film and quite a few other international prizes. It is suitable for the very little ones, from about 3 years old but will also very easily please a 6-year-old. The book series is written and illustrated by Belgian Gabrielle Vincent. She wrote very sweet and everyday stories to express human truths, the joy of making others happy and living simply, allowing her heart to speak out whilst gently mocking convention. The books are excellent. What makes them are the illustrations, in my opinion. We own two but have read many more and LJ, 3, loves them. But I find them quite difficult to read (from the parents' point of view). There is little text and the images speak much more than the written content. So I find myself adding a lot to the text. Not a bad thing, but difficult sometimes to convey the right message while letting the child see what is happening and understand the story by themselves. The film derived from the books lives up to our expectations. In a world of animations for kids dominated by one or two world giants, the film is a refreshingly different view of the world. It is a very sweet, heart-warming and all-round tender and caring animated family adventure with a very loving outlook on life and childhood in particular. The film is excellent. The illustrations are as beautiful as in the books. But the story-telling and appeal of the characters is even better. 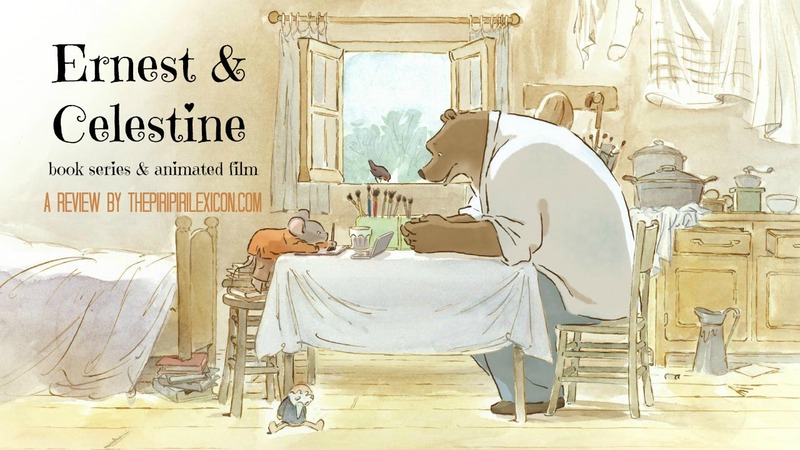 It tells the story of how Ernest, a large bear and Célestine, a tiny mouse, meet and become best friends and help each other be themselves and do what they enjoy. Célestine is a clever art-loving mouse refusing to follow the path all orphans in her world are destined to. Ernest is an awkward sweets-loving bear living by himself away from the other bears. The two characters are extremely likeable and witty. Even though Ernest is depicted as an adult bear, the two have many child-like features and characters. LJ went to see the film at the cinema with her grandparents and did not loose one bit of the action during the whole 81 minutes of it. She says the beginning is a bit scary (while Célestine is in the orphanage) but she still watches it. We recently purchased the DVD and she now knows the film by heart, has perfectly understood the story and likes to pretend she is Célestine when she draws and colours. As you've guessed it, I highly recommend this film. It is so sweet (have I used the word too many times?) and beautiful. A family favourite. The website for the film is worth a look. While writing this, I also discovered that there is also a lovely iPad app with six simple games. I shall keep it tucked away until our next road trip or flight! There are Dutch, Swedish, Italian, Greek and Norwegian versions of the film as far as I can tell. A release date is set for late June 2013 in the USA. And the books in Amazon UK (Ernest et Celestine ) or Amazon FR (ernest et celestine ).